SUNDAY TO FRIDAY ONLY, NON SMOKERS ONLY. Welcome to 'Birchwood' Cottage, Lake Muskoka, Ontario Your ultimate cottage getaway, just two hours north of Toronto, awaits! This stunning executive vacation property is located in the heart of Muskoka, Ontario’s #1 year round vacation destination. This newly renovated, luxury property is located directly on Lake Muskoka, right around the corner from the very popular, Walkers Point Marina. Together, the 1,300 square foot cottage and 750 square foot boathouse offer all the amenities that go into the perfect cottage getaway. The boathouse interior is not available but guests can enjoy the large screened in patio, huge sun deck and large dock on the water. This property offers very clean and comfortable accommodations for everyone in the family and boasts over 1,300 square feet of decking on three levels providing spectacular views of the lake. Beautiful open concept design and an abundance of floor to ceiling glass, offer stunning, panoramic views of Lake Muskoka and golden sunsets. This cottage is a spacious, bright, clean, newly renovated 3 bedroom unit that includes 2 floors of lake front living. The main floor consists of stunning views of the lake through floor to ceiling windows, large, fully equipped open concept kitchen with an island, granite counter tops, stainless steel appliances (fridge, stove, dishwasher), 3 piece bathroom and a very comfortable living area...perfect to sink back and relax after an action packed day at the lake. The main floor also consists of 2 bedrooms that contain queen size beds, luxurious 600 thread count bed linens, allergen / bedbug mattress and pillow protectors, fresh white quilts and soft white bath towels. To add to your enjoyment, step outside onto the 300 square foot deck and dine 'alfresco' under the stars! A laundry room is also available with a new washer and dryer. The ground level, walk out floor offers a large, bright guest room, a separate entertainment room and a bright, clean, 2 piece powder room. The large master guest room consists of a king size bed with plush mattress, luxurious 600 thread count bed linens, allergen / bedbug mattress and pillow protectors, a fresh white quilt and fluffy, soft white bath towels. For those media enthusiasts, family and friends will enjoy the large wall mount, flat screen TV with surround sound, for your ultimate entertainment. Walk right out and head down a few steps to the 2 story boathouse and enjoy the screened in patio, huge deck and large dock. Enjoy 3 seasons in all of their splendour. Spring and summer mean fun in the sun! Enjoy all of the water sports you can imagine from swimming, wake-boarding, water-skiing, snorkelling, motor boating, canoeing, kayaking, fishing or just relaxing by the shoreline. Autumn brings North America's most spectacular 'fall colours', Indian Summer, and harvest moons. Birchwood is a playground for children including a waterfront sandbox, tree swing, luxurious tree house complete with a balcony, muskoka chairs, dining set, bean bag chairs, and an assortment of toys. This property offers something for everyone. Please note that the rental period for this property is 5 nights, Sunday through Friday. Please visit for more information on Birchwood Cottage and for a complete list of things to do in the area. Fiddlehead Properties is passionate about offering quality hospitality throughout your entire stay by ensuring a very clean vacation home, fast connection with a property manager if needed, and a detailed list of items on our website to ensure your vacation goes smoothly. We look forward to having you stay with us and hope you come back again! No where in the world can you experience the breath taking views while feeling you are at home away from home. This gem of a cottage with a spectacular boathouse is everything you could want in a cottage, from the proximity to the water (a stone throw away), a gradual slope to the water, a large boathouse with a huge amount of deck space, perfect for relaxing with friends, and docking space for boat parking. In addition, this cottage is located on a very quiet dead end street so traffic and noise is minimal. Birchwood has 2 large bathrooms. The one located on the main floor has a shower / bath unit and the one on the ground floor is 2 piece. Both are newly renovated with pure white decor, white tile floors and granite counter tops. We are located approximately 10 miles from downtown Gravenhurst, Bala and 15 miles from Port Carling. We are centrally located between many world class resorts such as Taboo, Windermere, The Rosseau Marriott Muskoka. 10 minutes from the quaint villages of Bala and Port Carling. Amazing views of Lake Muskoka from the cottage, boathouse and all surrounding decks. Birchwood is located on Lake Muskoka. Brand new, crisp, high thread count, white luxury linens provided. Brand new, full size washer. Please provide your own detergent. Brand new, full size dryer. Brand new, soft, fluffy white towels provided. Open concept, bright living room, looking over Lake Muskoka. Brand new, stainless steel, full size dishwasher. Brand new, stainless steel, full size fridge with French doors and large, lower unit freezer. Brand new, stainless steel, full size stove with oven. Brand new, stainless steel, full size microwave. Basics supplied, salt, pepper, vinegar, oil. Dishes and utensils included, also an outdoor patio set. Open concept dining area open to kitchen and living area, overlooking Lake Muskoka. On main floor including IPOD jack. Large spacious lawn suitable for games in front of house. Kayak and canoe available to guests including paddles and life jackets. To ensure proper fitting please bring child lifejackets which must be worn on all water craft. Cottage boasts over 1300 square feet of outdoor living space, large 300 square foot deck facing Lake Muskoka at cottage and over 1000 square feet at water front / boathouse. This newly renovated, luxury property is located directly on Lake Muskoka, right around the corner from the very popular, Walkers Point Marina. Together, the 1,300 square foot cottage and 750 square foot boathouse offer all the amenities that go into the perfect cottage getaway. This property offers very clean and comfortable accommodations for everyone in the family and boasts over 1,300 square feet of decking on three levels providing spectacular views of the lake. From the ease of booking to this exceptional cottage property, this was the highlight of my summer! We were met by the owners and provided a tour and everywhere you looked was a stunning view to the lake. The cottage, while not large in size, has great comfort and warmth with many places to sit and relax. The lake temperature was just ideal for a hot summers day and we enjoyed the floating pad and the dock just soaking it all in. Thank you for sharing this beautiful corner of paradise with us, we had a such a great week! The cottage was easy to find by car and boat. The main cottage has been nicely renovated and had all the amenities you need for vacation. The outdoor section and screened-in portion of the boathouse were lovely too. The dock was great for the kids to jump off and swim and also to fish. The owners were involved with booking and check-in and it was very smooth. We look forward to returning in the future. As soon as we walked in to the cottage, we were immediately impressed with the beautiful decor and cleanliness. We were even more impressed with the view as soon as we stepped onto the deck. We had an amazing time and would definitely go back! The only criticism we have, while it was not too much of a concern for us but may be a concern during really hot summer nights, is that there is no air conditioning. Although the owners left several fans throughout the house, which helped! It's also nice to keep the windows open to let the nice lake breeze in. Great for a small family (tree house is every kids dream!). We are looking forward to our next stay there! Absolutely loved your little corner of paradise. To be on Lake Muskoka.. one of the gem lakes in Ontario and be tucked away facing an unspoiled view of Grandview Island was just what was needed for a break away from the push and pull of working for a living. The extended dock that wasn't present last year was a huge addition which allowed my partner and I some extended sun time in the afternoon .We spent hours watching the vintage wood launches motor by over a pitcher of Sangria before dinner . The cottage is ultra clean and your staff is to be commended on their attention to detail . Having the use of the kayak and canoe on the lake early in the morning , paved basketball area for a shoot around and badminton in the afternoon was a nice addition to help offset the lazy atmosphere your cottage inspires . Hope you received my email regarding a re booking for two weeks next year ! Fabulous opportunity to enjoy the Muskokas. 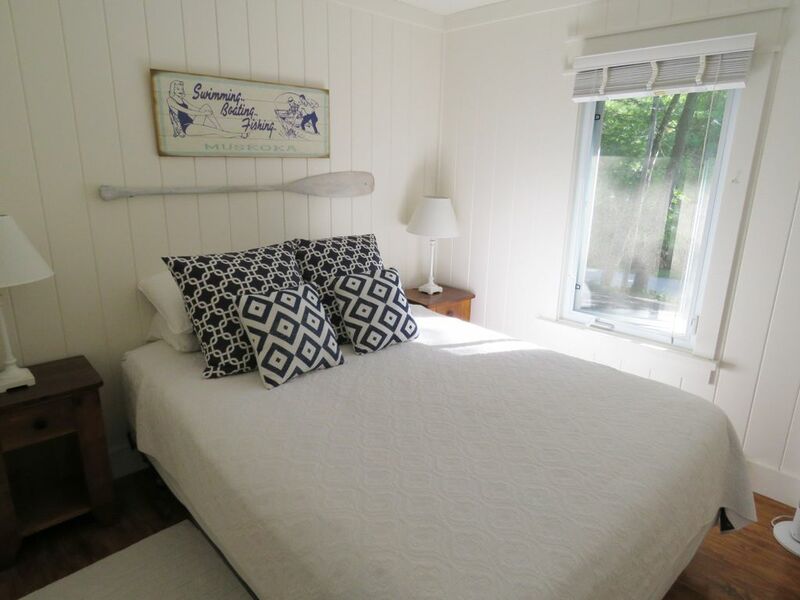 This is a lovely cottage and will provide you with an excellent opportunity to have the Muskoka experience. Relax and enjoy beautiful views, swim in the lake, rent a boat or enjoy family time inside the quaint, clean, well-kept cottage. Hike a pristine trail, star gaze, relax in front of bonfire, swim in sparkling waters, shop for that perfect piece of art, sip some local wine or beer on a dock, get up close and personal with wildlife, pamper yourself at a spa, give your taste buds a treat, photograph stunning vistas, or enjoy one of the many events and festivals which reflect muskoka's charm and uniqueness. Whether you feel like being outdoors or indoors, whether you are a beginner or an expert, whatever the season, whatever the budget, muskoka has something for everyone. Memorable experiences are guaranteed in muskoka - whether indoors or out, challenging or rejuvenating, in winter, spring, summer or fall, muskoka has something for everyone and every budget. Have a camp fire, make schmores, octopus hotdogs, or toast some marshmallows. Go see a movie in bracebridge.